Looking for an adventure this summer? Campers will explore classic showdowns from two productions in this year’s Davis Shakespeare Festival: Mary Stuart and As You Like It. Through theatre games, acting workshops and a culminating performance, campers will discover the thrill of this year's stories. Royals and Rivals Camp for ages 8-12 — Two sessions (July 9-20 and July 23-Aug. 3), both running from 9 a.m. to 3 p.m. (with options for early drop-off and late pick-up) Monday through Friday in the arboretum. 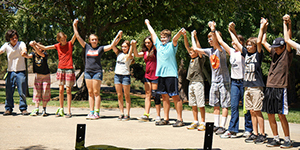 Teen Camp for ages 13-18 — One session, July 23-Aug. 3, 9 a.m.-3 p.m. Monday through Friday, arboretum and Veterans Memorial Theater, 203 E. 14th St., Davis. Register here for any of the camps.